Aries, the August 2018 horoscope clearly indicates that you need to "recharge the batteries". Your zodiac sign belongs to the fiery ones, blazing with energy, but now comes the time to bet on peace and relaxation. If you have naughty kids, do not try to re-educate them. Your nervous system may not bear it. At the same time, August 2018 is the month that will most certainly support technical skills and practical thinking by all people born in Aries. As an engineer, you will design a new Eiffel Tower, as a programmer invent a new music format, much better than MP3. Taurus, acting appealingly and looking representatively, this will be your main goal during August. Your zodiac sign counts to the most responsible ones. But August is a time when Taurus can afford a drop of rebellion. A small amount of irresponsibility or ignorance that is adequately dosed works as a strong spice and can give the right flavour to your life – the flavour of freedom and adventure. You may also experience a lot of thrill and excitement like in an old American western town. Thanks to this special constellation, the love of Taurus will flourish immensely. Gemini, fortunately, there is no stamped form, that someone would officially give you as a licence of your satisfaction, or perhaps as a proof of your smile. On the contrary, true joy must come from your deep inside. However, according to the horoscope we are 100% sure that a long bath (or a garden pool in the evening) with candles and flowers will definitely not spoil your mood. In August, people born in Gemini will be attracted to physical pleasures. Your spiritual life is important, indeed, but who has spoiled stomach or frozen feet usually does not have the right mood for philosophical thoughts. Gemini, the horoscope tells that you will yearn for comfort and luxury in the first place during whole August! Cancer, August will be the month of a major turnover. If you feel like you are doing well, be prepared to see the sun being obscured by the clouds in the bright sky. Cancer, of course, the opposite may happen as well. If you feel that you are left in rain without an umbrella, August will be the time when you may dry up (figuratively speaking) and find a blooming meadow or an orchard full of sweet fruits. Cancer, a fundamental "U-turn" may also come in a relationship or marriage, naturally depending on whether your love resembles a broken porcelain or rather a solid oak table. August will become a month of well-being according to the horoscope. Leo may look forward to the fact that the eighth month of 2018 will actually be full of abundance and prosperity. The horoscope says: Leo's mental and emotional activity will resemble New Year's fireworks, and material hardship will become so remote that you would need an astronomical telescope to see it at all. August will also be metaphorically a " junction" for Leo on his or her long journey of your destiny, resembling the renowned orient-express route. You should therefore come out, refresh yourself, rest and gain strength for the second half of the year, because this may be still a long and challenging journey ahead. In August, a more sensitive Virgo may be frightened. The new button that will appear in your favourite mobile application may easily surprise you and make uncertain at the same time. Are your data safe? Or another example, your beloved does not call you for 24 hours. Does this mean that your relationship starts to slowly break apart? The horoscope advice: calm down! Virgo, the chance of a nervous collapse is pretty high in August. Virgo, first of all, take a break. Otherwise, you will see things far more darker (unpleasant) than they really are. But what seems black at night can be finally white over the day. Libra, if you have to choose between a boring evening spent in opera or a weekend in the Alps, where you will experience a real snowy adventure, you should definitely choose the second option. You would disappoint the local "upper crust" anyway. In August, Libra will be a bit impish. Libra may be looking forward to a month full of adventure and excitement. Finally, Libra will become more playful and funnier. For others you will serve as a welcomed enthusiast. Everyday love will kiss your cheeks. According to the horoscope Scorpio can expect a new beginning in August 2018. You are probably to undergo a profound change or deep transformation. If you want to move this year, change your job or partner, try a new service or at least diet or sport, be sure that the ideal time is August 2018. Moreover, the horoscope reveals that Scorpio should also think more about confidence and trust (people, values, religion ...). Furthermore, the horoscope anticipates the arrival of more turbulent weeks during which you will realize how much the genuine love means to you. The August 2018 horoscope announces stormy energy in your veins. In August, people born in Sagittarius will try to influence others by their thoughts and opinions. You simply cannot live with the bare feeling that you are right. Sagittarius is essentially an idealist and a dreamer who wants others to share his / her intensive view of the world. But please, Sagittarius, stay calm and slow down a bit! Even those who love you can be fed up just within a few days – the active volcano rising from the depths of your heart is still too hot. Surprisingly Capricorn will be extremely hardworking in August. The morning alarm, which you think is rather annoying, may well start to remind you of a heavenly melody. Of course, it's an exaggeration, but indeed – according to the horoscope, you can shake off the feeling of futile efforts or useless existence. Capricorn, full of vigour, will build a Chinese-style summerhouse in the garden, set up a local "Poetry Friends Club", write a five-part cookbook, or build a bell tower that they do not have even in the Vatican. In August emotions of Aquarius will be tight as a guitar string. What is true for musical instruments can be applied to zodiac signs too – if the strings are well tuned, beautiful melodies can be played on them. However, the string may break or may be out of tune when playing hard. The horoscope for Aquarius therefore recommends to be open, visiting social events and try to establish new relationships or friendships (looking for new melodies and chords among well-tuned people). The destiny line drawn by your horoscope will meet with another very important and strong line in the eighth month of 2018. Find out which one it is! Pisces, § will be the month of expansion. You will be able to meet your goals at work, at home or in your love life. If Pisces want to climb on the highest mountain in the USA, Mount McKinley, win the World Figure Skating Championships, or make the entry in the Guinness Book of Records or just put the egg on top, be sure you will be able to achieve such a courageous goal. 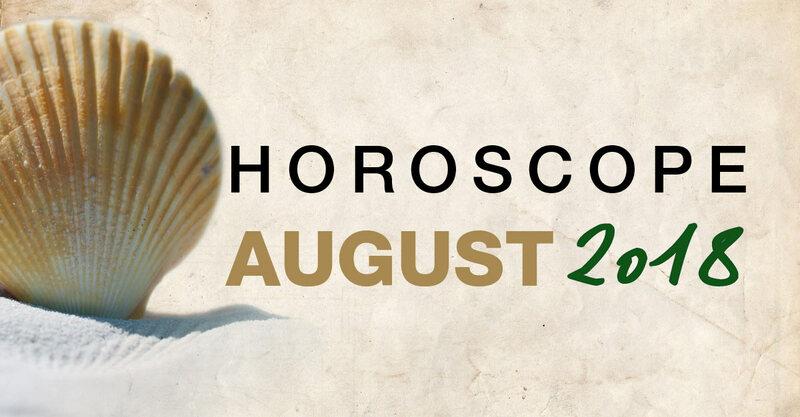 The August horoscope brings a great constellation of ideal harmony in internal energy of all Pisces. Even the strongest nuclear power plants could envy your strength and power.